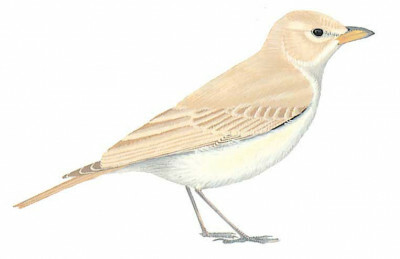 Dumpy, short-tailed lark with broad, rounded wings and floppy, slow, undulating flight. Colour variable, grey-brown with much variation; generally, they are unstreaked above except for vague mottling on mantle in some; underparts buffish or greyish white, unmarked in some, but diffusely streaked breast in others; rufous tinge to rump, flight-feathers and underwings in many. Longish, stout, pointed bill (yellowish horn with dark culmen), gently tapering, and dark brown uppertail grading into rufous-buff tail-base. Tertials fall clearly shorter than dark grey-brown wing-tip. See Bar-tailed for separation. Most other larks are obviously streaked above, have white or black in tail, or crests.